Dennis M. Galvin - Davison, Eastman, Muñoz, Lederman & Paone, P.A. 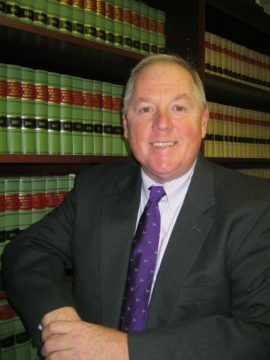 Dennis M. Galvin is a partner in the firm’s Municipal and Real Estate and Land Use Departments. A recognized leader in the fields of land use and local government law, he served as Chair of the Local Government Section of the New Jersey State Bar Association during 2011 and 2012, and served as First Vice Chair during 2009 and 2010. Currently, he serves as an Assistant Counsel to the New Jersey Planning Officials. While frequently representing municipalities on zoning, municipal land use and local government issues throughout New Jersey, he also advises developers and individuals with their site plans and variance applications, and has appeared before a variety of local boards. He has a background in the creation of Master Plans, Redevelopment Plans and Rehabilitation Plans. Dennis also has substantial experience in the areas of commercial litigation, business creation, business acquisition, landlord tenant law and collections. Dennis’ extensive knowledge has earned him the position of Instructor at Rutgers State University in the areas of zoning law and municipal land use law. He is also a frequent speaker on zoning, local government law and ethics. Most recently, he was the moderator for a panel on Land Use at the New Jersey State Bar Association’s annual meeting. He has written numerous articles that have been published in the New Jersey Planner, the State League of Municipalities Magazine, the New Jersey Lawyer and the Local Government Law Review; he is currently the author of Local Government Law, 4th Edition, New Jersey Practice (Volumes 34-35 A), published by West Services, Inc.
Dennis is a recipient of the Michael A. Pane IV Award for Ethics, established by the Pane Family and the New Jersey State League of Municipalities, honoring a municipal professional who exemplifies the highest standards of ethics and whose work has significantly enhanced the integrity of local government. Dennis received his J.D. from Seton Hall University School of Law in 1986 and his B.A. from Montclair State University in 1980. He is admitted to practice in New Jersey and the US Court of Appeals, Third Circuit. AHS Hospital Corp. v. Board of Adjustment of the City of Summit, et al. ; Docket No. UNN-L-0448-11, Decided by Hon. Karen M. Cassidy, A.J.S.C., Law Division, on February 14, 2013. Harborhead Condominium Association, Inc. v. Zoning Board of Adjustment of Point Pleasant Beach, et al. ; Docket No. A-2435-11T4, Decided by Judges Parrillo, Sabatino, and Maven, Appellate Division, on November 28, 2012. Ali Enterprises, L.L.C. v. City of Summit Zoning Board of Adjustment; Docket No. A-0381-11T4, Decided by Judges Fuentes, Graves, and Koblitz, Appellate Division, on August 20, 2012. Iron Mountain Properties, LLC v. Township of Freehold Zoning Board of Adjustment; Docket No. A-5744-10T4, Decided by Judges Fuentes, Graves and Haas, Appellate Division, on April 11, 2012. Cathy Beluch v. 829 Garden Condominiums, LLC, and Hoboken Board of Adjustment, et al. ; Docket No. HUD-L-667-11, Decided by Hon. Hector R. Velazquez, J.S.C., Law Division, on August 29, 2011. Muslim Center of Somerset County, Inc., et als. v. Borough of Somerville Zoning Board of Adjustment, et al. ; Docket No. SOM-L-1313-04, Decided by Hon. Peter A. Buchsbaum, J.S.C., Law Division, on May 16, 2006. Conflict of Interest Matrix, by Michael A. Pane, Jr. Conflict of Interest Matrix by Michael A. Pane, Esq. Board Members Have Immunity – Absolutely!